THE MAYBELLINE STORY : The Latin Lovers Villa becomes the Maybelline King's private estate in the 1930"s.
The Latin Lovers Villa becomes the Maybelline King's private estate in the 1930"s.
Here is a picture of The Villa Valentino in the Hollywood Hills, owned by Rudolph Valentino when he was engaged to Natacha Rambova. They lived there while their home in Beverly Hills, Falcon Lair was being built. Sadly, Natacha divorced him shortly after he bought the property and he was forced to live the lifestyle of the rich and famous alone. After Valentino's untimely death in 1926 Tom Lyle Williams, Maybelline's founder bought it and did a complete renovation inside and out. 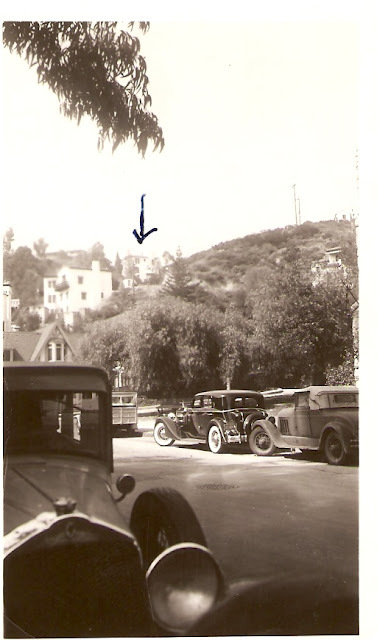 The Villa Valentino was located in the Whitley Heights section of Hollywood at 6776 Wedgwood Place, but was eventually razed to make room for the Hollywood Freeway in 1949. When Tom Lyle bought the Villa he loved it's old world feeling, but didn't like the lack of privacy, so hired a gardener who planted over a hundred Italian cypress, Palm trees and exotic tropical plants to hide the Villa from curious spectators. An arrow points to the Villa exposed to the public and you can just imagine how a good pair of binoculars might cause gossipy neighbors to spread unwanted rumors. Check out Tom Lyle's brand new 1937 Packard parked on the street where he shot this photograph with his Kodak. What a life he must have had in Hollywood in the 1930's, working with major motion picture studios, preparing contracts with the biggest stars and entertaining at the Villa Valentino. Stay tuned for more pictures of the Villa Valentino before the restoration and after. You can also read about Tom Lyle in Hollywood and the Maybelline company in my book The Maybelline Story. Purchase an autographed copy from me at maybellinestory.com.